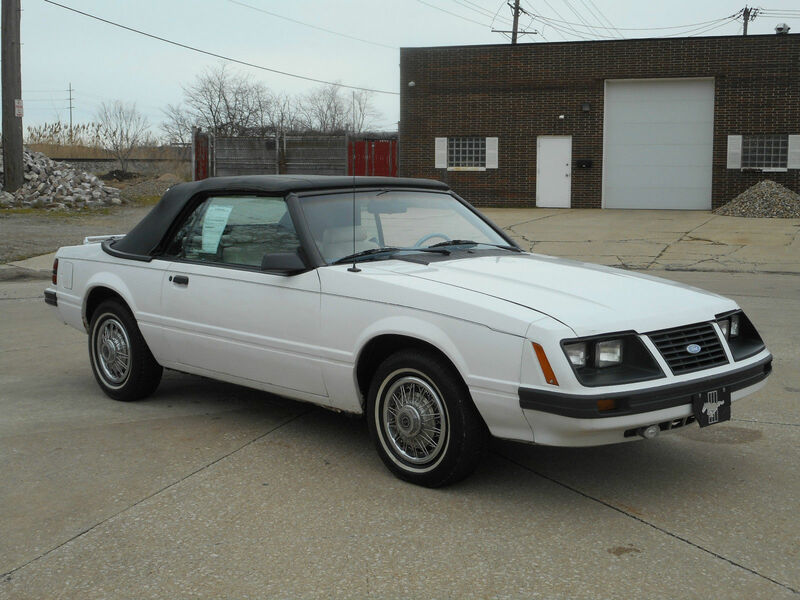 Check out this 1983 Ford Mustang GLX Convertible here on eBay bidding for $2,358 with auction ending on Thursday (today) at 5:00PM PST. Thank you for looking at our classic 1983 Ford Mustang GLX Convertible. This car was owned by an older gentleman and we believe that he was the original owner. The car drives great. 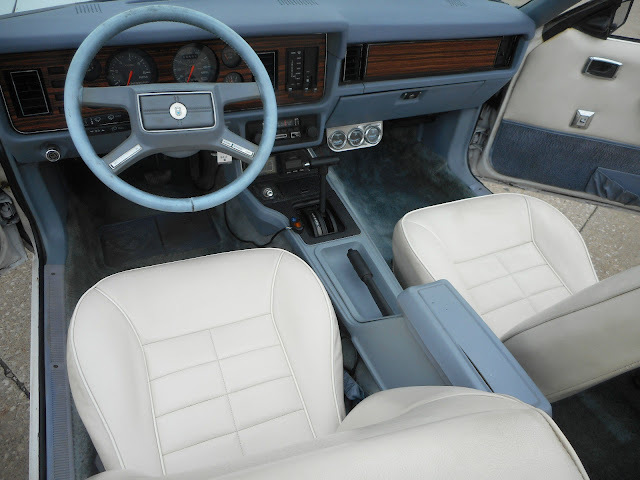 The interior is very clean, with no rips or tears in the leather. The features on this car are: power windows and locks, tilt and cruise, power top, AM/FM radio & cassette with factory power booster, power steering & brakes, automatic transmission, and air conditioning. The 64,000 miles are actual and the title is clean. All options work correctly, but we have not tried the air because it's still cold outside. 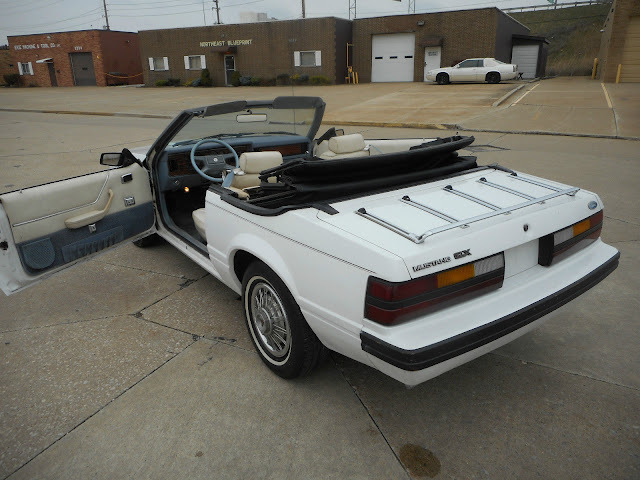 The convertible top seems to be in good condition, and the body is nice. Sometime within the last ten or fifteen years, both sides from the pinstripe down were painted. The body presently has maybe a couple bubbles on the very bottom of the doors and fenders, but not noticeable in the pictures. The underneath of the car we believe to be solid (there is a picture). This is one of the first convertible models Ford made of the Mustang after they brought the convertible back. We'd also like to mention we have the parade boot that comes with the car. If you're looking for a fun summer car to drive with the top up or down, this Mustang should do the job for you. GOOD LUCK TO ALL BIDDERS! This is an as-is vehicle, which means that once you buy it, you own it with all faults (known or unknown). We are Euclid Car Co. at 1231 E. 286th St., Euclid, OH 44132. 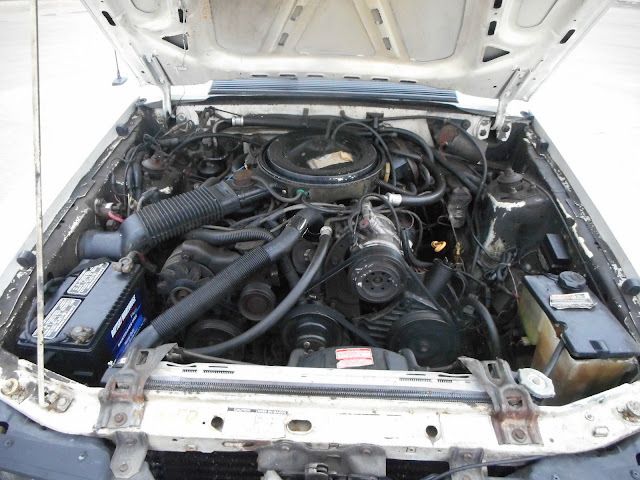 We would like the vehicle picked up from our lot within 7 days of auction ending. There will be a $100 paperwork fee added on to the final sale price of the vehicle, along with a $15 title fee. By Ohio law, we must transfer this title into your name. The reason being is that if we would just send you the title and it was to get lost, there would be a problem. Or if we would send you the title and you didn't transfer it for several years and it got lost, it would be an even bigger problem. We follow the law of our state and will make sure that the title is transferred correctly for all customers. We will not pay any shipping fees, but we would be glad to assist your shipper in picking up your vehicle. If you have any questions, call Lou at 216-210-8488. Good luck bidding! Yeah, plan on cutting in and welding all the appropriate floorpan reinforcement. And is that really a six, or a 2.3 junk-rattler four? 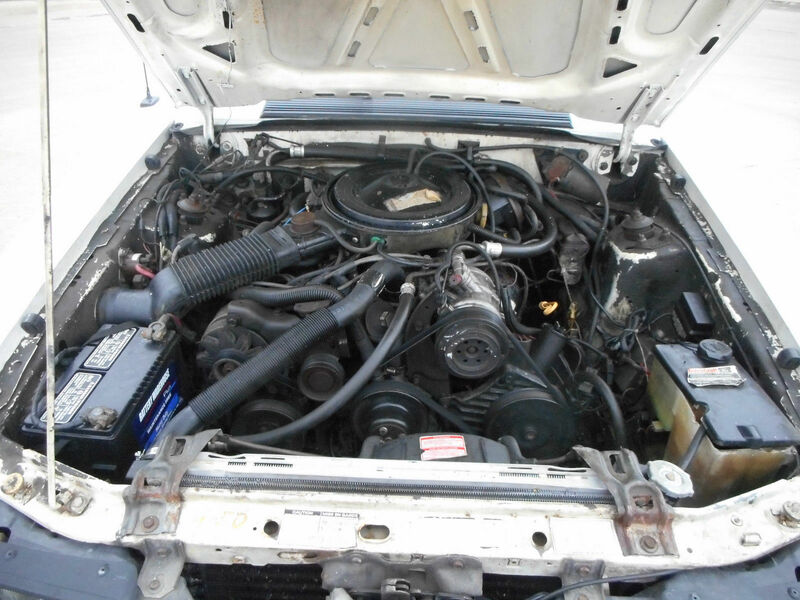 I'd hope whoever buys this thing budgets for a 302 swap.